350/365(+1), a photo by Luca Rossini on Flickr. 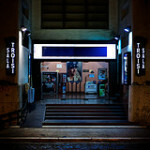 Massimo Troisi has been one of the greatest Italian comedians of all times. For the boys and girls of my generation, Massimo Troisi has been almost a hero, he was some sort of moral model, summed up and consecrated in his last play, Il Postino. The movie has been a huge success, and not only in Italy, since it has been nominated for five Academy Awards (best picture, best director with Michael Radford, best adapted screenplay, best original song, and, obviously, best actor in leading role with Massimo Troisi). To understand why Massimo Troisi became a sort of unlucky/sad hero, you have to know that he died twelve hours after he finished acting in Il Postino. He knew he was sick, he had been sick since he was nineteen, he had his first cardiac surgery when he was just twenty three. And he should have received another surgery in 1994, but he wanted to act in the movie first. He probably was afraid that his heart wouldn’t have lasted much longer, and he really wanted to play this last role literally more than anything else. He died because of the fatigue of the movie, while he could have quit acting, received the surgery, and maybe got some more years to live. This is why Il Postino is considered to be the moral testament of Massimo Troisi, because by watching it you know that there’s something the actor is telling to the audience that was, to him, more important than his own life. So much that, when his job for the movie was over, his sick heart finally stopped pumping. 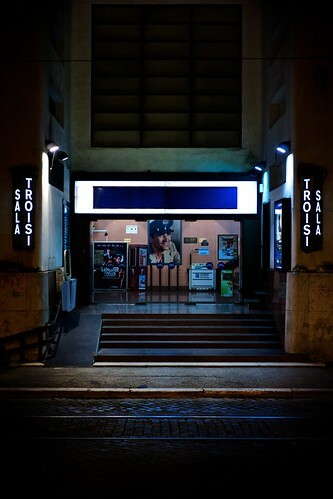 The daily shot pictures the entrance of the movie theatre in Rome dedicated to the memory of Massimo Troisi. It’s him, in the big central photograph, wearing the costume of the postman he played in Il Postino. If you haven’t seen the movie yet, I suggest you to do it this week: now that you know the “rest of the story” you’ll understand why it is such an essential movie in the Italian culture. Have put it on my short list, along with Swept Away!